In the midst of this beastly summer we’ve just entered, nothing seems farther away than the lung-clenching air of winter. When things are this hot, and pools and popsicles fail to cool, there’s one foolproof way to get into the spirit of winter: The Lurking Horror. … you practically froze to death slogging over here from the dorm. Not to mention jumping at every shadow, what with all the recent disappearances. 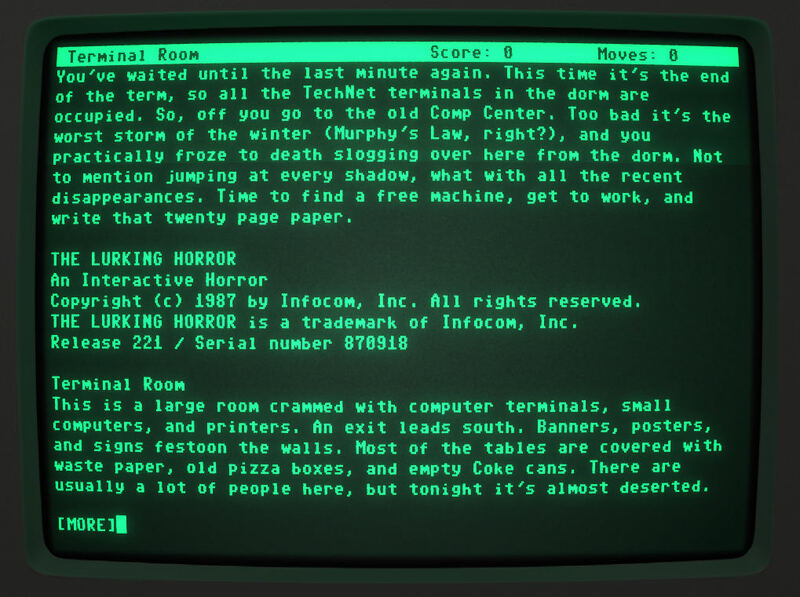 The Lurking Horror is a classic Infocom text adventure and a sibling of Zork. For best results, couple this game with Cool-Retro-Term, a Cathode-Ray-Tube terminal monitor simulator. CRT boots you off your 2015 high-DPI display and beams you into a world of 1980s nostalgia. First install cool-retro-term. Then install frotz (the Z-Machine engine which runs all the old Infocom text adventures). Crank up the AC, grab your clicky keyboard, make CRT fullscreen, turn off the lights, and bathe in the cool cathode rays.